A 75 year old woman complained of very atypical chest pain, lasting days, worse with movement and palpation. There is diffuse ST depression, very worrisome for ischemia. The patient had a negative initial troponin, which was puzzling to the providers. The patient was admitted and serial troponins were all below the level of detection. She underwent a stress sestamibi that was completely normal. Now there is now only minimal, nonspecific, ST depression. I was consulted on this ECG and I asked: "What is the K?" The answer was 3.2 mEq/L, and I said "Well, that probably does not explain it." But the 2nd ECG normalized after K replacement to 3.9 mEq/L. And there is no other explanation. 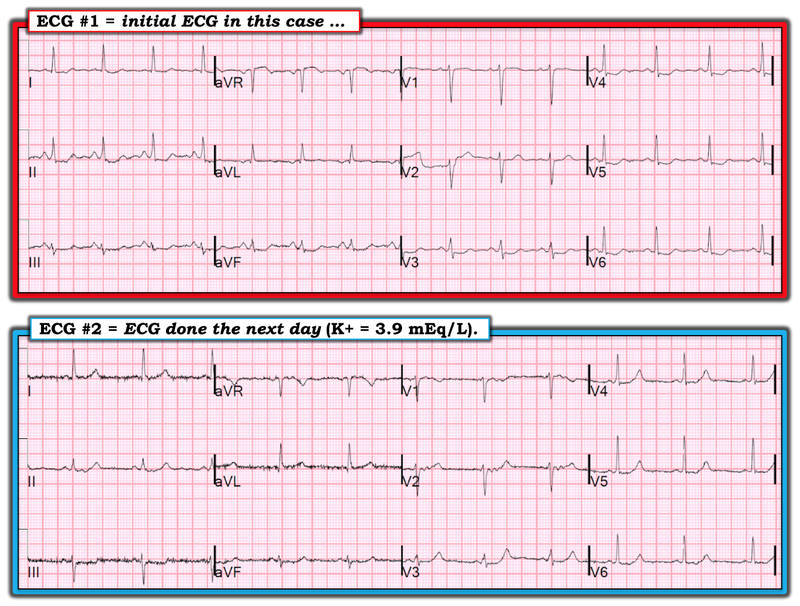 A potassium of 3.2 mEq/L is usually not low enough to cause ECG abnormalities. The STD on ECG-1 almost certainly due to hypokalemia, and resolved with treatment of low K.
When do you need to admit a patient for hypokalemia? 2. any ECG abnormalities that are due to hypoK. I believe this is an important case because: i) It illustrates how easy it is to fall into “the trap” of automatically assuming acute ischemic heart disease as the cause of chest pain whenever an elderly patient presents to the ED with an ECG showing diffuse ST depression + ST elevation in lead aVR; and, ii) It illustrates the very helpful concept of deriving empiric knowledge (ie, clinical reasoning and learning based on clinical correlation and evolution of the case). For clarity — I have put both tracings from this case together in Figure-1. Figure-1: The 2 ECGs done in this case (See text). Although this patient’s history sounded atypical for acute coronary disease — given her age and presentation to the ED, this possibility clearly has to be 1st on one’s list of diagnostic entities. After all, in the initial ECG (TOP tracing in Figure-1) — there is ST segment scooping and depression in no less than 9 leads, with ST elevation in lead aVR. The QTc looks fairly normal — and I do not see U waves (so I was not initially thinking of hypokalemia). 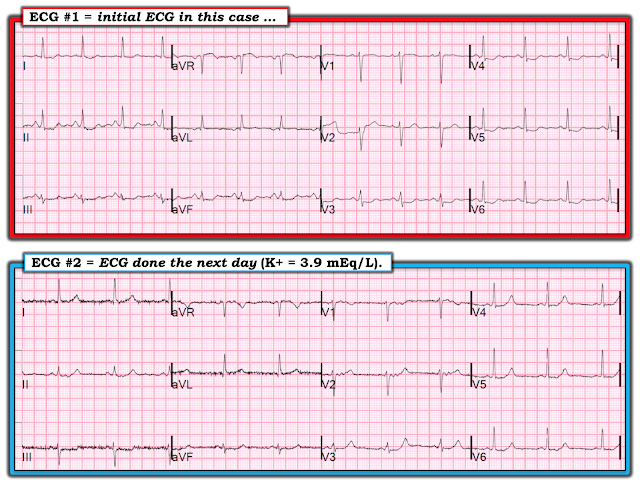 When I first reviewed this case — I looked at ECG #2 before reading about what was done clinically. On seeing this 2nd tracing — I thought to myself that despite the atypical history, that my initial presumption of severe coronary disease was supported because: i) the amount of ST depression in several leads was less in ECG #2 compared to ECG #1; and, ii) T waves were now clearly much more upright in multiple leads (leads I, II, and V2-thru-V6), with a somewhat peaked appearance that seemed to me unusual for a baseline ECG in a 75yo patient. I thought the combination of ECG #1 followed by ECG #2 suggested the presence of “dynamic” ST-T wave change, that supported my initial presumption of acute coronary disease. KEY POINT — The diagnostic approach undertaken by the clinicians in this case was totally appropriate = Assume significant coronary disease (possibly proximal LAD, left main or severe multi-vessel disease) until proven otherwise. By the concept of “empiric knowledge” — I mean that despite logical presumption of diffuse subendocardial ischemia/severe coronary disease from the ECG picture in ECG #1 — the negative serial troponin values and completely normal Stress Sestamibi Test weigh strongly against this initial presumption. This means we “need to go back to the drawing board”. As per Dr. Smith — the only difference clinically in this patient was normalization of a slightly low serum K+ value (ie, 3.2 mEq/L at the time ECG #1 was obtained) — to a normal serum K+ value (ie, 3.9 mEq/L by the next day) following K+ replacement at the time ECG #2 was obtained. Therefore: i) We need to revise our initial presumption of severe coronary disease; and, ii) We need to alter our working diagnosis to the probability that correction of serum K+ may indeed account for the ECG changes we see in the 2 tracings shown in Figure-1. Additional THOUGHTS — I found this case intriguing. I would add the following thoughts to the excellent comments by Dr. Smith. Remember that >95% of body K+ is intracellular. When we measure serum K+ values — we are measuring ECF (extracellular fluid) serum values, which really provide no more than a “through-the-window” glance at body K+ stores. Thus, there might be much more severe body K+ depletion than we might expect from a serum value that is only “slightly low” at 3.2 mEq/L. In my experience — hypomagnesemia may exert comparable clinical and ECG effects as hypomagnesemia. It’s important to realize that as is the case for K+, a similar predominance of body Mg++ is intracellular. This means interpretation of serum Mg++ levels is not as simple as looking at the numerical value you get back from the lab. So, I’d love to know the corresponding serum Mg++ levels for this patient at the time the 2 ECGs in this case were obtained. I’d also love to see this 75yo woman’s true “baseline” ECG. Does she truly have upright T waves with the same peaked appearance as we see in ECG #2? If so — this would prove low serum K+ as the cause of the ECG findings in ECG #1. If not — then perhaps despite the negative Sestamibi Stress Test — there may be some coronary disease (intermittent ischemia that may have resolved) in this elderly woman? ECG #2 is not yet completely normal. I’d like to see one more follow-up ECG in order to truly understand what this patient’s ECG baseline looks like after electrolyte equilibration (might take more than just 24 hours). Finally, I’d like to share an additional empiric PEARL I learned over many years of Attending our clinical service and reading all service ECGs. Some patients manifest a particular repetitive pattern of ECG evolution in response to certain clinical conditions. I saw this most often with either ischemic patterns or hyperkalemia — but the same might hold true for hypokalemia. For example, we had a cadre of older patients who when they became dehydrated — developed subtle T wave peaking ("relative" hyperkalemia from volume contraction). Once I got to recognize the names of these patients — I became able to alert our housestaff on seeing their initial ECG to check hydration status and electrolytes based on no more than subtle ECG clues. Similarly for ischemia — some patients may develop very subtle changes (ie, no more than T wave flattening). So if you were to be the primary care provider charged with caring for the 75yo woman in this case — and if the above additional follow-up measures all confirmed hypokalemia as the cause of the unusual ECG sequence seen in the 2 tracings in Figure-1 — you might be able to avoid repeat cardiac evaluation on a future ED visit that may easily be treated by simple K+ replacement. Hi. As an anesthesia resident on call I was shown an ecg of a middle aged patient that was due thyroid surgery the next morning. She had no significant previous medical history and were on no medications. She had a routine ecg taken as part of her preop eval and it looked the same as in your exampel. Because of the ecg she had undergone stress test and formal echo which were all normal. Her K was 3,2. Thanks to your blog I was aware of the etiologies of STD. Thus, I replaced her K with 60-70 mmol of oral KCl and her K the next morning was 4,1 and her ECG had normalized. Her surgery was uneventful.